Pastor Sherri (a former Mills Lawn student herself) was delighted to see today's Mills Lawn students delivering 40 large bags of grocery to the Community Food Pantry located in the Methodist Church. A really big "thank-you" to all the students who helped with the food drive. 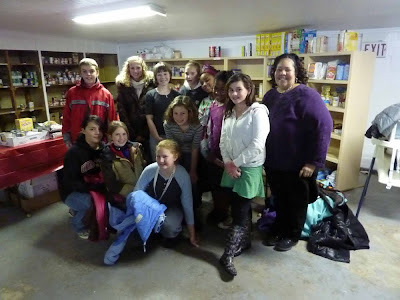 The need for food assistance has increased over the past year and the Yellow Springs community continues to be very generous in their support for the Food Pantry. The Mills Lawn Elementary School contributions will go a long way toward meeting the food needs this Christmas. For questions about the Food Pantry call the Methodist Church at 767-7560. Your continued support is much needed.